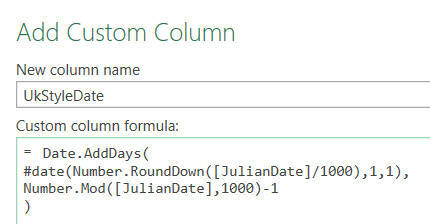 This short blog explains how to convert Julian dates to "normal" ones, and how the formula used actually works! I've shown the UK-style date alongside, but this is actually what we're trying to derive. 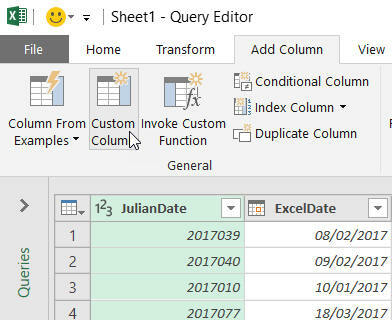 This blog explains the theory of how to convert the dates to a UK or US format, then shows how to do this in Power Query. You can try this out yourself using this workbook. I got the idea for this from this blog, and it was prompted by a question from James Cartney. You need to subtract 1 because in the Julian date format the first day of January is day one, not zero. Choose to import a workbook. The data in our example is held in a sheet imaginatively called Sheet1. Click on this button at the bottom right. Add a custom column to your query. You can paste the formula from the box below. My only remaining question is: who uses dates in the Julian format?